First, before you can install and use Link you must install Connections. Follow this link to the installation instructions. Install Link as you would any other WordPress plugin. Browse to where you downloaded the Link zip file and select it. After you have activated Link, go to the Connections : Settings admin page and click the Licenses tab. Enter the support license key that you received in your receipt email and click the Activate button. With your support license key activated, any time there is an update to Link released, you will be notified in the WordPress admin with an opportunity to update to the latest version with a single click. Now that Link is installed, activated and the support license key is registered, let’s configure Link. You need to give your user roles add/edit entry capabilities. How do you do this? Go to the Connections : Roles admin page. There you will find boxes, one for each role available on your site. Under each role is a list of all the capabilities available for Connections. Decide if you want your users to add and edit with or without moderation. Have you decided? Good. To allow users to add and edit without moderation check the boxes for Add Entry and Edit Entry and then click the Update button. To allow users to add and edit with moderation check the boxes for Add Entry Moderated and Edit Entry Moderated and then click the Update button. Do this for each of the roles that you want to allow adding and editing. The last step is to enable the “View My Directory Entry” action link and “Edit my Directory Entry” entry action. Go to the Connections : Settings admin page and click the Display tab. Scroll down to the Result List Actions section and enable the “View My Directory Entry” option. You can optionally drag and drop the actions in the order you prefer. NOTE: If a user does not yet have an entry in the directory, they will instead see an “Add My Directory Entry” link. Scroll down to the Entry Actions section and enable the “Edit My Directory Entry” action link. You can optionally drag and drop the actions in the order you prefer. To allow your users to edit and maintain their details from the front-end rather than from the Link admin profile page, install and activate the Form extension. 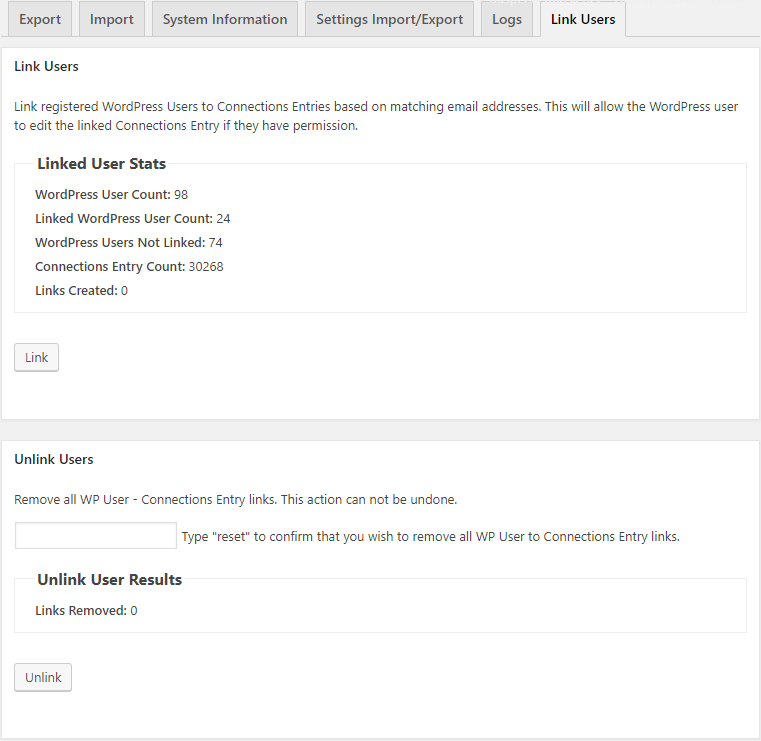 This tool can be used to link your existing WP Users to your existing Connections Entries. It is not required to run this tool as your WP Users will be linked when they log in to your site automagically. It is safe to run this tool at anytime as it will only check existing WP Users which have not be linked to a Connections Entry when processing links. 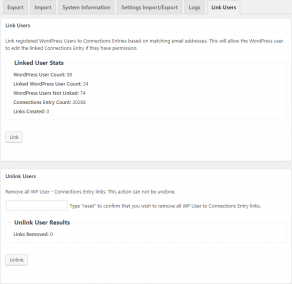 This tool can be run to unlink all WP Users. It can be useful to run after testing and you want to reset before deploying your site. Be very certain you want to perform this action because it can not be undone. To help prevent this tool from being run accidently, you must type “reset” in the provided textarea before clicking the Unlink button. Use this shortcode to add the “View My Directory Entry” in your pages or posts, anywhere shortcodes are supported. If the user has not been linked to an entry, it will instead display the “Add My Directory Entry” link. This shortcode can be used to display the “Edit My Directory Entry” link in your pages, posts, anywhere shortcodes are supported. If the user has not been linked to an entry, it will not be displayed. This shortcode has one option to configure the link text. Can I add the View/Add and Edit links to my menu? Yes, you can. To do this you first need to install the Nav Menu Roles plugin. This plugin is required because it allows you to choose whether or not to display menu items based on the user’s role and whether the user is logged in or not. Why is this not built in to Link? Well, it could be, but due to a limitation in WordPress only one plugin can hook into the admin menu. I think is far better to work with Nav Menu Roles since it is already widely used and supported. After you have installed the Nav Menu Roles plugin go to the WordPress Menus admin page and click the Custom Links panel. The panel will display the URL and Link Text options. 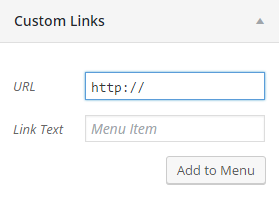 In the Link Text field you would add the text that you wish to be displayed in the menu. Since the “View My Directory Entry” / “Add My Directory Entry” link is dependent on whether the user has been linked to an entry or not you need to supply the link text for adding and viewing the entry. 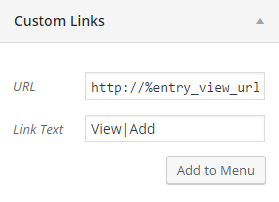 You can add both titles to the Link Text field by separating them with a pipe ( | ). The text before the pipe will be used for the “View My Directory Entry” link text and the text after the pipe will be used for the “Add My Directory Entry” link text. In the URL field leave the http:// and then add the URL token for the link you want to add. And then click the Add to Menu button to add it to your menu. %entry_view_url% :: This is the URL token you will use to add the “View My Directory Entry” / “Add My Directory Entry” link to your menu. This token will be replaced with the URL for viewing the user’s linked entry. If the user has not been linked to an entry the token will be replaced with the URL for the user to add their entry to the directory. %entry_edit_url% :: This is the URL token you will use to add the “Edit My Directory Entry” link to you menu. This token will be replaced with the URL for editing the user’s linked entry. 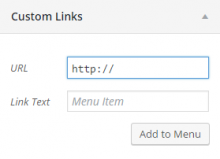 If the user has not been linked to an entry the menu item will not be displayed. After you have added both items to you menu, make sure you set the Display Mode to Logged in Users. Here are two screenshot example which show the settings to use for adding “View My Directory Entry” / “Add My Directory Entry” and “Edit My Directory Entry” links to your menu. "View My Directory Entry" / "Add My Directory Entry"
Why is Link not linking the user and entry? The entry should be in Connections prior to the user logging in. Otherwise, the user should use the “Edit My Directory Entry” admin page added by Link to add their entry. This is the intended workflow. What trips people up in testing is that links are checked for only once and they are persistent. Link will check once when the user logs in and if no email address match is found, that user is not checked for a match again no matter how often you change the email address in the user or Connections entry. The reason links are persistent is that users change email addresses fairly often; you wouldn’t want a link to break because of an email address change in either the user profile of the entry. You also wouldn’t want it easy to hijack the links. Because links are persistent, they are also difficult to break. If you need to for any reason, you have to delete both the user and the their entry in Connections and re-add both. Create a new entry in Connections with an email address. Create a new user in WordPress with the same email address. Go to the Edit My Directory Entry admin page. The user should now be linked to the Connections entry. If a link is not being created perhaps you are using a membership type plugin. If you are, it is possible it is hijacking the login process before Link has the opportunity to run. If that is the case, please contact support. I’ve installed Link, but how do users add or edit their entry? There are two places in the admin where they can find the form to add or edit their entry. The first is under the the user’s “Profile” page, Link adds a new sub-page called, “Your Directory Entry”. This will be right under the “Your Profile” admin page. The second place can be found under the “Howdy, Some User” menu on the top right of all admin pages. It’ll be the link named “Edit My Directory Entry”. Both of these links go to the same admin page for Link where the user can add and edit their entry. QuickTip: Do you require that you users add and edit their entries in the front-end? Checkout Form. Link and Form have been designed to provide a seamless easy to use experience. NOTE: It’s important to point out that even though this looks like the same form as found under the Connections : Add Entry admin page, it is actually a completely different admin page. Typically users will not be able to see or access the main Connections admin pages unless you’ve setup their role to grant them capabilities which give them access. The “Why are my users receiving the “You are not authorized to edit entries.” error?” FAQ has more details on how to setup your user roles with the correct capabilities for Link. Why are my users receiving the “You are not authorized to edit entries.” error? If your users are receiving this error it is because the role they have been assigned does not have add or edit entry capabilities for Connections. Huh? What did you just say? Let me explain. Every registered user is assigned a user role. These roles define what a user is permitted to do and not do once they are logged in. By default all users are a “Subscriber”. Ok, so how do I give my “Subscribers” the add/edit capability? This is really easy. Go to the Connections : Roles admin page, there you will find all the roles that are available and under each a list of every capability that is available for Connections. The capabilities you’re interesting in are two pairs of options; “Add Entry” / “Edit Entry” and “Add Entry Moderated” / “Edit Entry Moderated”. If you check “Add Entry” and “Edit Entry”, the users assigned to the “Subscriber” role will be able to add and edit their entry for Connections without admin moderation. Similarly, if you check “Add Entry Moderated” / “Edit Entry Moderated”, the users assigned to the “Subscriber” role will be able to add and edit their entry for Connections with admin moderation. While you here, make sure to add the add and edit capabilities the other user roles. Once you set the options, don’t forget to save them by clicking the “Update” button. That’s it, your users will not longer receive that nasty error message and they’ll be able to add and edit their own entry. Easy, right? Can I edit which user is linked to which entry? Sorry, no, because Link was designed to work as silently in the background. It is possible this functionality will be added based on user feedback. I already have users, how do they get linked? Link has a feature called “Link on Login”. What does this do? As your registered users log in Link will search the Connections entries for their email address, if one is found, that entry is automatically linked. If there are more than one Connections entries that have the same email address as the user logging in, Link will link the user to the first entry it finds with their email address. Basically what this code does is if the logged in user is not an admin user, the page is redirected the admin User Profile page. This redirect occurs before Connections admin add/edit functions have an opportunity to run. The fix for this is to reprioritize the the Connections admin add/edit code to run sooner, before the redirect in WishList Member. Here’s how. Save and Activate the new snippet. Your users should now be able to add and update their entries. The Pie Register plugin is calling a core WordPress action, wp_login on login which Link hooks into but it is not passing both of the required parameters so when other plugin such as Link hook into it, it will fail with errors. This is a bug with Pie register. The only fix right now .. You’d have to edit that file, all three instances, to either remove the call or add the second variable. The safest solution is the latter because it might be possible that “Pie Register” may run in a way the core WordPress action wp_login is never run and it needs to run for Link and any other plugin that may rely on it. When this plugin is active Link fails to link a user to an entry. The reason is the plugin removes the wp_login action that is required to trigger the linking. This just might fix an issue with S2member, but it also will remove the action Link requires to run on the wp_login hook. There is a bug with its custom login that can cause third party plugins such as Link to fail. The bug is in the login.php file found here: ../PennyTheme/lib/login_register/login.php. On line 385 the theme is calling the wp_login WordPress action, but the action is not passing the $user object which will cause Link to fail as it requires that object. This will break any third party plugin that relies on that object calling this action. NOTE: This FAQ written based on Penny Auction Theme 1.2.4 by SiteMile.